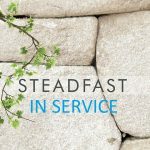 Steadfast in Service is all about giving honor, help and provision to low income retired missionaries, ministers, true widows and orphans that are in need within the body of Christ Jesus. We provide the following service (if needed) to those that qualify in Springfield Missouri. In addition to these we also work closely with each individual to help connect them to other organizations in Springfield that might help fulfill their current needs. If you know of a low income elderly missionary, retired minister, widow/widower who has labored in Christian ministry and has been an active follower of Jesus Christ and are in great need of some level of assistance please contact us. We will be glad to meet with them and assess their needs and if they qualify.